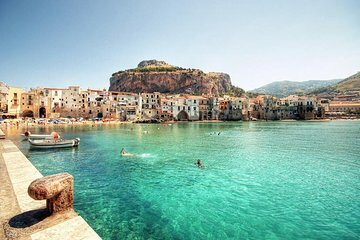 Enjoy the Medieval town of Cefalù with this half-day tour from Palermo. Take in the views during the scenic 1-hour drive from Palermo to Cefalù. Explore Cefalù on foot at your leisure. See the beautiful Duomo, Porta Terra piazza, Mandralisca Museum and more. It was nice to go around different part of Sicily away from Palermo. We got to Monreal and Cefalu. Both place tour guide just dropped us and gave us 90 minutes in each places. No guide book or map. We got lost in Monreal, but there was information center in the city kind of guide us to exit. I was hoping that they could have give us guide of the city. And guide dropped us at City center by Palace instead of hotel we were originally picked up. It was worth the price that we paid for. It was okay, I wish I had more explanation or guide of places that we visited. Read the fine print...this was basically a private taxi service to Cefalu...the guide explained things on the way but once we were there he pointed out the city highlights on a map and told us we have an hour an a half to see what we wanted to see...very disappointed and my worst victor tour yet...after many bookings all over the world. I ended up being the only one on the tour, but instead of canceling and refunding, they went ahead and gave me a private tour, which I was very impressed with! Michael was my tour guide, and we had pleasant conversations in the 45 minute van ride from Palermo to Cefalu and back. He was very knowledgeable and led me to all the important sights, and went out of his way to help me get Pepsi to drink at lunchtime! Duomo was great and had some fun sightseeing. Enjoyed this tour!